There are so many cat dandruff cures out there that it can be hard to know which one to try. Many of the most common cures are simple and inexpensive natural home remedies, some as easy as just keeping your cat out of the sun. If your cat has dandruff, you’ve no doubt looked into all the dandruff treatment options and have perhaps been a bit confused. Can you really cure cat skin problems with at-home remedies or is it necessary to take a trip to the vet and fork out the money for a special shampoo? As a cat owner, you will undoubtedly run into the issue of cat skin problems. There are many different problems a cat can develop with its skin with varying degrees of severity and treatment requirements, and some symptoms may be hard to distinguish from normal cat behaviors. How do you know if cat hair loss is due to a skin problem or if it’s just a natural part of aging? 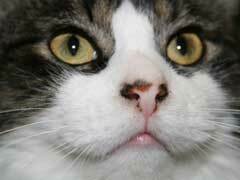 Mange in cats, also called feline scabies, occurs when tiny mites called Notoedris cati burrow into a cat’s skin. Cats may also be infected by mites called Demodex cati, which also cause mange in dogs, but this type of mange is much less common in cats. These mites lay eggs, which hatch and produce new mites. For mange in cats, the average mite life cycle lasts two to three weeks and will continue to propagate if untreated, sometimes resulting in burrows as deep as several centimeters. 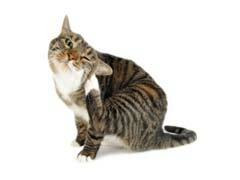 When dealing with cat skin problems, the most obvious sign is a cat over-grooming, biting, or scratching. Some hair loss may occur just because of constant scratching. 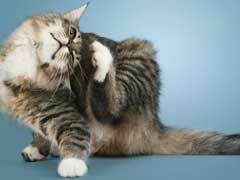 So, what gives a cat itchy skin? While the most obvious answer is fleas, there are other signs to look for. If what gives a cat itchy skin are not the tiny parasites Ctenocephalides felis (the common flea), it can still be caused by other parasites. 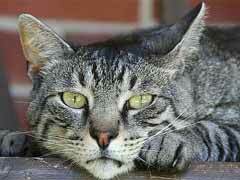 Mange in cats is caused by another parasite too small to see with the naked eye, Notoedres cati. 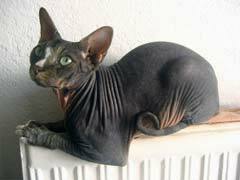 The areas of skin affected by feline mange become scaly and itch, and spread of infection comes with patchy hair loss. The dog mange, Sarcoptes scabei may also pass from an infected dog to a cat, but this mange usually does not sustain on a cat for long.